In honor of Pixar’s latest release, Incredibles 2, opening this Friday, and my love of list-making, I’ve put together what I believe to be Pixar’s top five movies. This was a difficult task because all of Pixar’s output is at least good, if not outstanding. Even the Cars trilogy has merit, though they are my least favorites of Pixar’s soon-to-be list of 20 feature films. America loves fast cars and Larry the Cable Guy—what are you going to do? It just doesn’t interest me. But it pained me to not include certain titles, like the Toy Story movies (so funny and such a surprising yet inevitable story choice—of course your toys come to life when you’re not looking and experience anxiety when they are out of your favor! ), Monsters, Inc. (so cute and a wonderful look at our pure selves as children before the world conditions us to fear, not to mention the literal power of laughter over fear), Up (life-long love, keeping your sense of adventure, the importance of friendship, and a hilarious talking dog), and The Incredibles (a fun superhero yarn and spy thriller that embraces family and accepting your true self). That’s enough of the ones that didn’t make it on my list. Here are the Pixar films that I think are the best of the best—the ones that master story, present a meaningful message, can be enjoyed by all ages, and have stellar animation that could only be outshined by future Pixar productions. On the surface, this is a story about an unlikely chef—a rat—who succeeds in bonding with a human to cook delicious food. For anyone who gets drawn into cooking shows, finds it difficult to not be entranced by food preparation, and loves cooking and drooling over creative food in general, you will love this movie. When you watch Ratatouille, you wish you were being served a multiple-course meal inspired by the dishes prepared on screen—and you wouldn’t even care if a rat was running the kitchen. (This movie inspired me to learn to make potato leek soup and perfect my own rendition of the recipe over a number of years.) Indeed, the animation is so good that it inspires salivation. It captures the spirit of France and French cooking. The characters are lovable and real, and playfully animated. On a deeper level, this story is about following your dreams no matter how many times you’re told no, you can’t do it. It’s about transcending the perceived station in life that has been assigned to you. 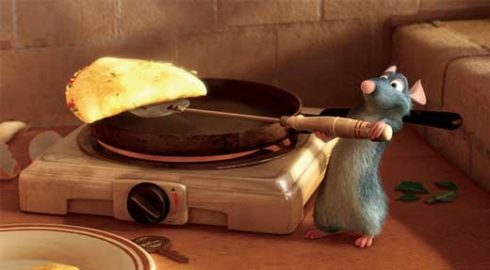 For Remy the Rat, that means defying his father and family to become a chef instead of a scavenger. For Linguini, Remy’s human sous chef of sorts, it means rejecting society’s repulsion with rats to gain a true friend. He must also accept himself and the fact that he’s not a good cook despite his father being the recently deceased acclaimed chef Auguste Gusteau, who is also Remy’s inspiration. Sometimes it’s ok not to be exceptional at something you’re expected to be, and it’s just as well to be amazing in a way that’s completely unexpected. For the perpetually unsatisfied food critic Anton Ego, it’s about discovering what makes you happy, even if it’s the simple French peasant dish that reminds you of family. You should always be true to yourself—a wonderful and inspiring message for both children and adults. This is another film with the theme of being true to yourself and following your dreams, with the added current of the need of families to support each other and to forgive. Coco also points out that hero worship can be misleading, as popular celebrities are only showing the public what they want the public to see. Real heroes are genuine and do what’s right, even if it means sacrificing fame. These are the people that should be looked up to. 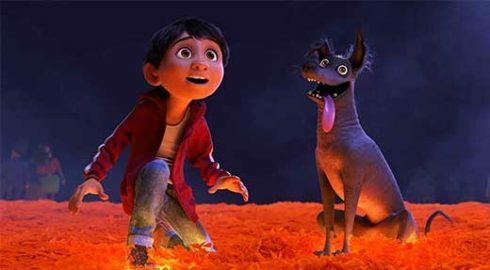 The film’s story follows Miguel, a 12-year-old boy who loves music and playing the guitar like his hero, Ernesto de la Cruz, a long-dead, legendary musician and actor from his hometown. Miguel’s great-great-grandfather left his great-great-grandmother and great-grandmother, Coco, when she was a little girl to pursue a career in music and never returned. So Miguel’s family forbids music and shuns musicians. You can read more about the plot and his critical appreciation in Brian’s review, but I do want to mention that the animation is breathtaking, and not in the Seinfeld, “You have to see the baby” sense. The animation actually took my breath away; the first time the expansive Land of the Dead appears on screen, it was so powerfully beautiful that my eyes welled up and I got a lump in my throat. Not only that, but this film was released at a very important time, when the racism and inhumanity of so many people in this country are attacking people of Hispanic origins and ethnicities. Exposing more people, including children before the teachings of bigots are deeply burned into their personalities, to elements of Hispanic culture promotes acceptance and empathy, while Hispanic people get a wonderful story that includes and celebrates their beautiful culture. Inside the mind of pre-teen girl Riley live five personified emotions: Joy, Sadness, Anger, Fear, and Disgust. Joy has been the dominant emotion felt by Riley, an avid ice skater and hockey player, up until her family moves away from their Minnesota home to San Francisco. That’s when her emotional state becomes more complicated, and the four other emotions begin to influence Riley more and more. Comedy and peril ensue. In the end, a balance is achieved, allowing experiences and the memories formed by them to be influenced by a combination of emotions at times, or letting a singular emotion get his or her healthy share of expression. Inside Out is a funny, bittersweet rollercoaster of emotions. It teaches kids (and even adults) who might be having a tough time understanding everything going on in their head and why they feel the way they do, that it’s normal to experience emotions—it’s what we do in response to those emotions that matters. The film may even help kids communicate better with their parents and guardians. Adult viewers will no doubt remember what it was like juggling emotions and butting heads with their parents, or even butting heads with their own kids now; there are a lot of original and humorous Oh, that’s so true moments in this film. And it’s so masterly conceived by Pixar—the inside of Riley’s mind is surreal yet easily understandable, vibrant and original. For my analytical mind, I like the illustration of experiences forming emotions and memories, which, collectively, form one’s personality. I’m very interested in discovering the why of emotions and actions. Plus, it’s an adventure! With the best imaginary friend ever, Bing Bong! Who’s your friend who likes to play? Bing Bong, Bing Bong. His rocket makes you yell “Hooray!” Bing Bong, Bing Bong. Who’s the best in every way, and wants to sing this song to say. Bing Bong, Bing Bong! Yeah, I’m a big kid. Or an immature adult. Come on, you gotta love Bing Bong! Maybe I like this movie so much because it reminds me of my own state-of-mind, past and present. I have a FUNKO Pop figure of Bing Bong that sits on my work desk to inspire me. I love the ocean. I’ve always been fascinated by it—from being afraid to take a bath after seeing Jaws (I was like six-years-old, OK? ), to the typical ’90s pre-teen girl loving dolphins, to gazing into the huge tropical aquarium at the Minnesota Zoo for much longer than the other kids, to getting more excited than I should about Shark Week and shark-themed B-movies (I’m talking Deep Blue Sea or this summer’s The Meg, not Sharknado). Finding Nemo captures so much beauty in its depiction of the ocean and the Great Barrier Reef. There are times when you can’t tell that you are looking at animation. Then the lovably nebbish worrywart Marlin, his determined son Nemo with the underdeveloped fin, the short-term-memory-deficient Dory, or any of the other delightful characters appear on screen. You become even more impressed that Pixar’s animated characters are cute, anthropomorphized animals that never seem out of place in the photo-real settings. When Nemo is captured by a dentist looking for an addition to his fish tank—and eventually his terrifying niece—Marlin must get over his fear of the big, wide ocean to find Nemo and bring him home. He makes friends along the way, and learns not to be such a worrier—all while spouting some hilarious Albert Brooks-isms. Nemo learns that his small fin doesn’t have to hold him back—despite being told over and over that he can’t do things, he, and those around him, realize that he’s just as capable as everyone else. 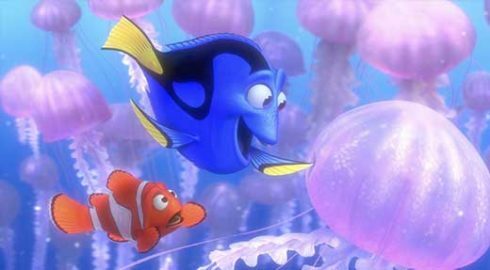 Marlin and Nemo’s father-son bond is solidified; Dory has a new home, and everyone learns that friends can be family too. Finding Nemo makes the audience realize that people, like fish, have to live their lives with as little fear and worry as possible—otherwise life’s adventure will pass you by. And if something bad does happen, follow Dory’s advice: “Just keep swimming, swimming, swimming…” Finding Nemo even has sharks too: “Fish are friends, not food,” say the Fish-Eaters Anonymous sharks who are trying not to give in to their murderous feeding frenzy urges. How could I not love this film? The story of a clunky yet cute trash compacting robot tasked with cleaning up a decimated-by-garbage plant Earth. He’s the last of his kind, as all others have long stopped functioning. He’s friends with a spunky cockroach, and he is endlessly fascinated by odd treasures he finds, including a tiny plant he found growing, and watching his Hello, Dolly VHS tape. He’s lonely and wishes for someone to love. Enter badass EVE who has been sent to Earth from the humans’ spaceship to check on the status of the planet. Can it sustain life? She searches for plants as evidence that humans can come back to Earth after their extremely extended stay on the spaceship, which was supposed to keep humanity going for five years, but it ended up being 700 years. 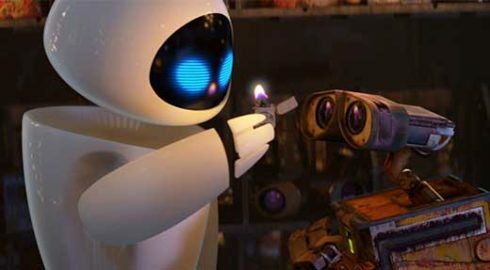 WALL-E falls for EVE instantly and gives her the plant. Automatic functions take over, securing the plant and bringing it back to the human spaceship; WALL-E follows, concerned about his unresponsive companion. On the spaceship, humanity has turned into lazy, zoned-out, squishy lumps; people ride around in hover recliners while robots deliver food and entertainment to consume. EVE and WALL-E want the plant to be delivered safely to the captain of the ship so everyone can travel back to Earth, but there’s a 2001: A Space Odyssey-Hal-esque computer that doesn’t want that to happen. WALL-E is part Sci-Fi, part love story, and part biting critique of humanity’s terrible treatment of our planet and general laziness. I’m a sucker for all three. Again, incredible animation from Pixar, with the humans looking comically cartoonish while the scenery is photo-real at times and just plain enchanting at others. The robots are detailed and exhibit the most emotion. Eventually, everyone works together to make the Earth habitable again. An important message for all ages; this film shows potentially real consequences to our mistreatment of the planet, while still shining a light of hope on the potential of humanity to come together and change our ways for the greater good—for progress. 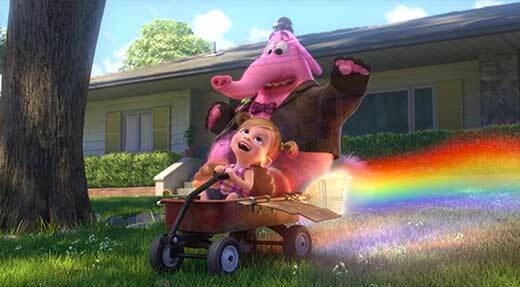 What are your top five favorite Pixar feature films? Share your comments below or post on Facebook or Twitter.